Windows Data Recovery Software provides complete solution to restore all your lost files and folders that have been inaccessible, accidentally deleted or misplaced from hard disk drive formatted on FAT, VFAT, FAT16, FAT32, NTFS and NTFS5 file system. Fully support all major IDE, SATA, EIDE and SCSI disk drive of your Desktop PC/Laptop. Hard disk data recovery tool works easily thus providing good alternate to all available costly and time consuming file recovery services with the facility of restoring the recovered file at user specified location. ◆ Easily recovers lost files and folders accidentally deleted from Recycle bin folder or permanently deleted using Shift+Del keys. 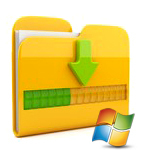 ◆ Restore files including text files, picture files, audio files, video files, images, documents etc from FAT/NTFS file system based hard disk drives. ◆ Recovers and restore data from formatted, corrupted or partitioned Hard disk Drives of all major disk manufacturers including Seagate, Toshiba, Hitachi, Maxtor, Samsung, Acer, Sony, Transcend, HP, Fujitsu etc. ◆ Provide quick retrieval of files and directories missing, deleted, logically crashed due to power failure, software/hardware malfunction, sabotage, virus attack etc. File retrieval tool support all major operating system like Windows XP, Windows Vista, Windows Server 2003, Windows 2000, Windows NT and Windows ME/98. File recovery utility, with GUI user friendly interface is secure and simple to use that does not require any technical skills to operate it.